Paco Rabanne Pour Homme by Paco Rabanne is an aromatic fougère fragrance for men. Old is gold, and Paco Rabanne Pour Homme proves this point to a tee. This iconic scent is a classic barber shop fragrance that’s masculine, green, herbal and downright incredible. As popular today as the day it was released. An addictive, spicy and sweet scent with a long-lasting mix of rosemary, oakmass and lavender. The herbal opening soon develops into the floral heart before ending in a spicy soapiness. The whole scent is wrapped with honey hints. 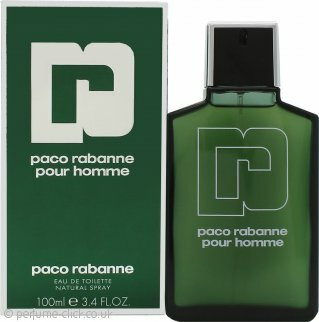 Paco Rabanne Pour Homme by Paco Rabanne was launched in 1973. Good product and good price for a spray in this classic after shave. Delivery was quick and well packaged. Paco Rabanne Pour Homme Eau de Toilette 100ml SprayHubby loves this fragrance! My husband is very fussy when it comes to wearing eau de toilette, so when he tried this one, he was really happy with its fresh fragrance. He will certainly buy it again.